I have been trying to decide on a painting for the wall in my office since I started working there two years ago and finally decided to make one! The only catch was that it had to look good on my office’s lime green wall…challenge accepted! We laid down a cheap plastic drop cloth and then used some spare wood to lift the canvas off the ground so that the edges were not touching the floor. This helped the paint drip off the canvas without sticking to the drop cloth. To mix the paint I put about a tablespoon of paint in 5 different cups (I made two white ones on accident). Then we divided the gloss medium in between the five cups, I put more of the medium in the colors that I liked most. Last, we put about 1 tbsp of water in each cup to thin out the mixture to the consistency of Campbell’s tomato soup, so on the thinner side. This makes it a lot easier to get the paint to spread. I didn’t add water in my previous fluid acrylic painting and I think it made it a lot easier! Then we poured! I have no idea why we poured were we did. Just let it happen. Then we swirled! We put on our gloves and each held one side and tilted the canvas until our paint was covering all the empty spots on the canvas. If you are having trouble getting a spot covered then the spatula comes in handy! Either use the spatula to gently move the paint or scoop up drippings and add them back to the painting. Then I used the extra paint drippings and my brush to paint the sides. Once it was dry I decided that we should frame it to give it a really finished look. It wasn’t too hard to frame but it did take some planning. We measured the the length of the canvas and then cut two pieces to match that measurement, about 36 inches. Our next two pieces needed to be a little longer to meet up with outside edges of the canvas plus the new frame pieces. So we measured the canvas plus the additional 2 inches from the 1×3’s and cut the next two pieces to be that length, roughly 38 inches. After the pieces were cut I stained them and waited for them to dry. Good patience training. Once the pieces were dry we used the four corner braces and the screws they came with to attach the pieces to each other. The way this frame will work is that your painting will be held into the frame because the frame is a snug fit. The canvas isn’t truly attached to the frame. 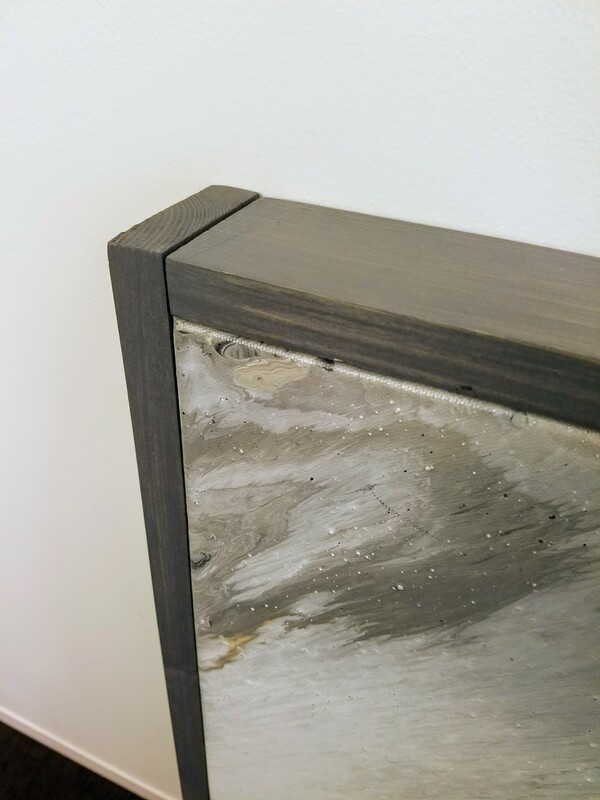 The reason that the canvas will not fall to the back of the frame is because the braces create enough of a lip on the inside of the frame so that the canvas won’t fit past them. So the important thing with the braces is that you want to set the braces back from the front of the frame the same distance as the width of your canvas. Then when you put the canvas in the frame the braces stop the canvas from going back farther than being flush with the front frame. 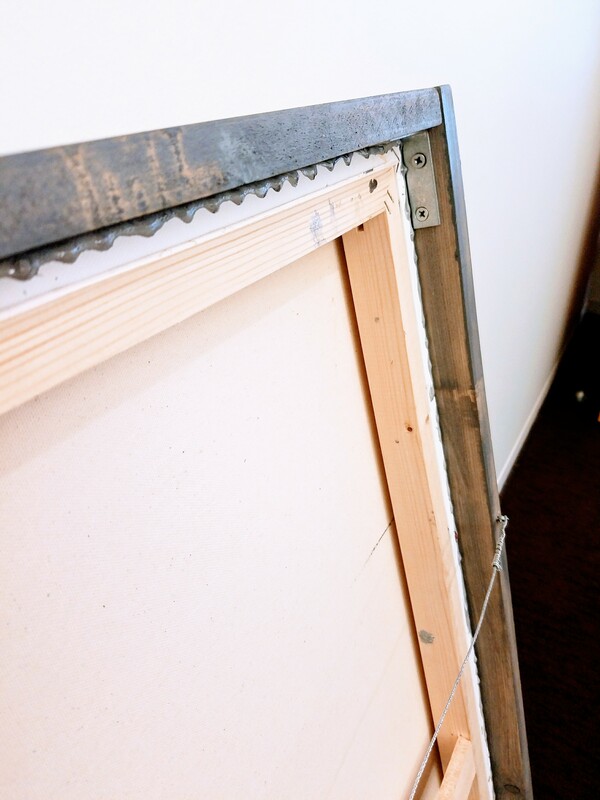 For example, our canvas was 1 inch thick, so we placed the top of the bracket down 1 inch from the front of the frame. See the original instructions we used here. The painting ended up weighing ten pounds so we used a 20 pound hanging kit to add a wire on the back. I really love how both this painting and frame turned out! I can’t believe I am finally going to have something to hang in my office! Interestingly enough I think one of my favorite things about this project is that I could take the canvas out, repaint it anytime, and pop it back into its frame! Easy! 20 Free Succulent… on Succulent Embroidery!